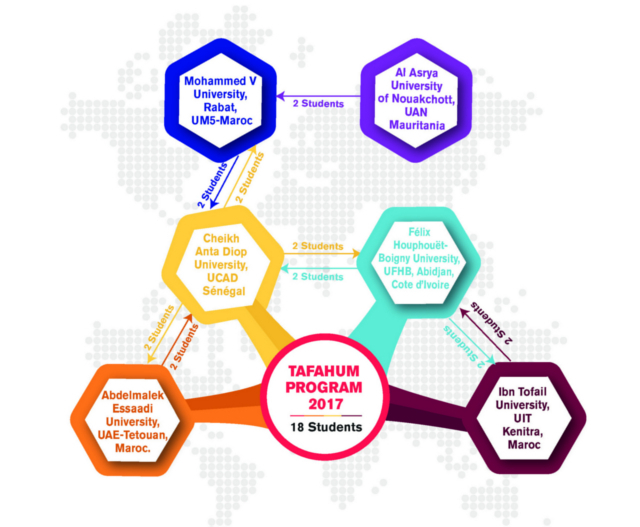 On 18 September 2017, ISESCO hosted its first exchange students from Mauritania, who benefit from the TAFAHUM program. This program focuses on students exchange program among Higher Education institutions in the Arab, African and Asian regions. The main objective of this program is to contribute to the development of the academic community in ISESCO Member States as an advanced knowledge society. During this year, eighteen students (Master’s degree) in the fields of: Science and Technology, Engineering, Business and Management from different universities: Abdelmalek Essaadi University, Mohammed V University and Ibn Tofail University (the Kingdom of Morocco); Cheikh Anta Diop University (Republic of Senegal); Félix Houphouët-Boigny University (Republic of the Ivory Coast); and the University of Nouakchott (the Islamic Republic of Mauritania), will benefit from this program. This program is being implemented in partnership with the Agence Universitaire de la Francophonie (AUF). On 19 September, a Meeting was held in the University Mohammed V, at the Faculty of Science. This meeting was attended by Mrs. HASSIKOU Rachida, the Vice dean for Research, Innovation and Cooperation at the Faculty of Science, Mrs. BENABDELLAH Ghita, Representative of International Relation at Mohamed V University, Mrs. AMZIL Amal, Manager of European program at Mohamed V University and Mrs. MEREZAK Maha, Supervisor of ISESCO Center for Promotion of Scientific Research, ICSPR. The two Mauritania Students, Mrs. HACHIMI Eslemhoum and BOUCKA Hasna were assisted by their respective tutors: Pr. B. Elbenani from IT department and Mr. Abdelrhani Moundib from the Faculty of Art and Humanities, and assigned to their universities.